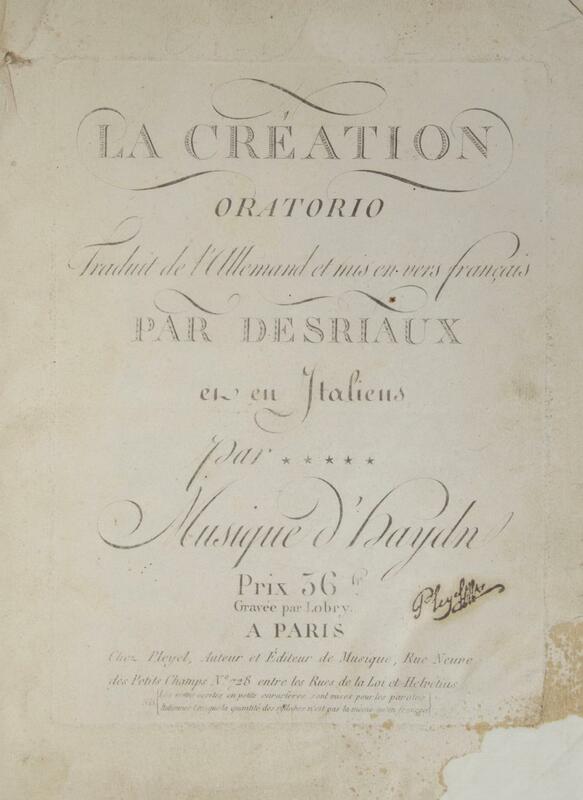 Paris: Pleyel [PN 359], 1801. Published just a short time after the first French edition by Erard. Hoboken XXI:2 (p. 37). Hoboken 9, 1395 (later issue, with price of 48 francs instead of 36). RISM H2525 (no copies recorded in the U.S.).. Folio. Contemporary vellum-backed speckled paper boards, paper label to upper with titling in manuscript. 1f. (title), 311, [i] (blank) pp. Engraved. Text in French and Italian. Outer and lower edges uncut. With publisher's facsimile signature handstamp to title. Boards somewhat worn and rubbed; label partially lacking at edges. Minor creasing, staining, and wear; tear to lower margin of pp. 139/140, slightly affecting printed area; small stab holes to pp. 290-311; small binder's hole to upper inner margins throughout. Lower outer corners of first several leaves lacking and filled in with laid paper, slightly affecting notation in several instances. Aus dem Französischen übersetzt und mit Anmerkungen versehen von Mich. Wagner . - Wien, bey Carl Schaumburg, 1801, 8, L, 458 pp., 1 Bl. Druckfehler, 1 Falttabelle, 2 KupferTaf., schöner Pappband. 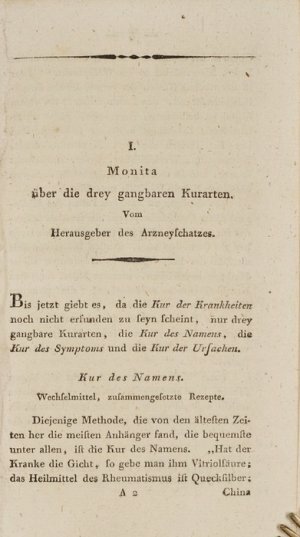 "Die Befreiung der Irren von den Ketten"Die extrem seltene erste deutsche Ausgabe des im gleichen Jahr erschienen Grundlagenwerk "Traité médico-philosophique sur l'aliénation mentale, ou la manie". Einer der wichtigsten und wertvollsten medizinischen Klassiker und Markstein in der Geschichte der Psychiatrie. First German Edition. One of the most important medical classics and one of the most valuable texts in the history of psychiatry, written in the opening year of the new century. It is both a postcript to the eighteenth and a preface to the nineteenth century. Pinel wrote this treatise on the basis of his experience in the Bicêtre. His medical theories and classifications are very methodical and clear and they contain some original ideas, but their importance pales in comparison with his work of hospital reform and reorganization by which a new tradition was established and a new perspective opened for practical and research psychiatry it is this achievement which always come to mind when the name of Philippe Pinel is mentioned. On May 24, 1798, at the risk of his own life and liberty, he struck off the chains of the insane at the Bicêtre, placing them in hospitals under lenient physicians, and doing away with the abuses of drugging and blood-letting to which they were subjected. London:: For J. Mawman. Very Good+ with no dust jacket. 1801. Hardcover. Color Illustrations; Six Picturesque Views in North Wales, Engraved in Aquatinta by Alken, From Drawings Made on the Spot: With Poetical Reflections on Leaving that Country. 4to, 19th-century gilt armorial vellum over bds; rubbed. With 6 hand-colored aquatint plates. Rough-trimmed Internally generally clean, edges a little dust smudged. Abbey Scenery 517. 32 pages 6 color plates 30 cm. The Fall of the River Machno, Carnarvonshire --Pont y Pair, Carnarvonshire --Conway Castle, Carnarvonshire --Pulpit of Hugh Llwyd, Merionethshire --Pont y Glynn Dyffis near Corwen --Bedgelert Church. Carnarvonshire. Strikingly vivid plates. ; 0 . Langlois Paris -05 1801 - Ten stipple engravings, printed in colours and finished by hand, with fine, strong colours. Framed and glazed. Overall size: 55.8 by 40.7 cm. 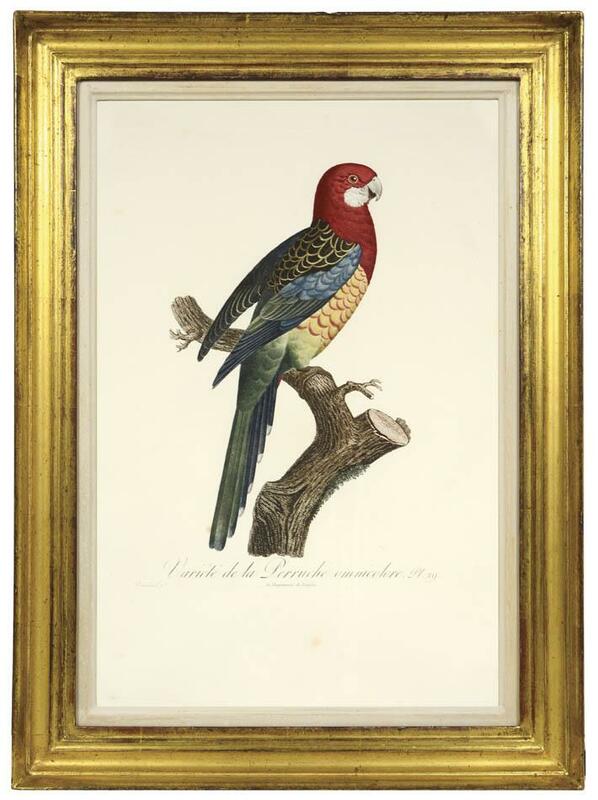 Jacques Barraband was the finest ornithological artist of his time. The son of a weaver at the Aubusson Factory, he is first mentioned as a pupil of Joseph Malaine (1745-1809), the eminent flower painter, and is known to have worked for both the Gobelin Factory and the porcelain factory of Sèvres. His most important work was undoubtedly the 300 or so drawings that he produced for François Levaillant's three great ornithological monographs, including the present Histoire Naturelle des Perroquets, which is considered the most comprehensive and complete catalogue on the subject. This magnificent work includes some of the most lively and colorful bird illustrations ever created. They capture not only the defining characteristics of the species, but also the charming personality of the individual bird. Voyage dans la Haute Pensylvanie et dans l'État de New-York, Par un Membre adoptif de la Nation Onéida. Traduit et publié par l'auteur des Lettres d'un Cultivateur Américain. 3 Bände. ASIA: ASIA. TO MAJOR JAMES RENNELL, ESQ.R F.R.S. &C. &C. THIS MAP IS INSCRIBED, BY HIS MUCH OBLIGED HUMBLE SERVANT A. ARROWSMITH. LONDON: PUBLISHED JANRY 1ST. 1801 BY A. ARROWSMITH NO. 24 RATHBONE PLACE. Copper engraving with original hand colour, dissected into 24 sections and mounted on original linen, folding into original card slipcase (Excellent, especially fine original hand colour, only a few very small, light stains; card slipcase scuffed with some minor loss to lower edges), 125 x 145 cm (inches). - London, 1801. An absolutely stellar example of Aaron Arrowsmith&#146;s resplendent wall map of Asia, the finest map of the continent made during the Enlightenment Era. 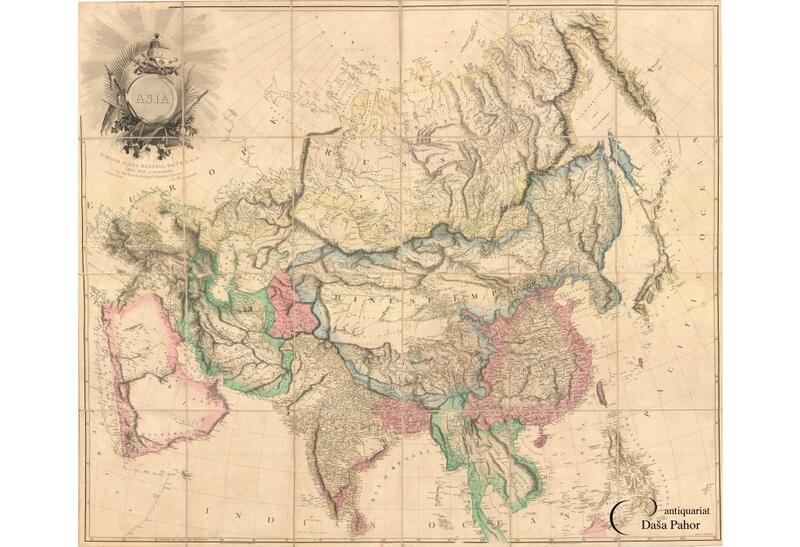 - This powerful composition represents the apogee of the cartography of Asia during the Enlightenment Era. Showcasing virtually all of Continental Asia on a monumental scale, the map was made by Aaron Arrowsmith of London, who due to his privileged connections with all of the official and private map-making entities of the British Empire, was during this time the world&#146;s most important map maker. Asia is presented with unprecedented scientific accuracy, although it will be apparent to the modern observer that, while some areas are projected with amazing accuracy, other areas reveal that European knowledge was very limited. The present example of the map is especially fine, as the original colouring is much more lavish and brilliant than on most other examples, while the fact that the map is dissected and folded into its original slipcase, has ensured that it has been preserved in remarkably stellar condition. The map takes in most of Asia, extending from the Ural Mountains and the Aegean Sea, in the west, all the way east to include the Kamchatka Peninsula and the Philippines; and from the Arctic Ocean, above Siberia, in the north, all the way down and the northern part of Malaya, in the south. The engraving, which is of unusually high quality, dramatically brings out the topographical details, such as rivers, lakes, deserts and mountains, while each region is coloured in the resplendent original hues that were signature traits of Arrowsmith&#146;s masterpieces. Interestingly, the map also features some notes describing historical vignettes, as well as major traditional overland trade routes and the tracks of some key recent European voyages in the Far East. Aaron Arrowsmith was obsessive about acquiring the best and most recent geographical sources, not only from British entities, but also from foreign contacts and mapmakers. He was remarkably gifted at discerning the most accurate geographical intelligence from a wide variety of, sometimes contradictory, sources, sorting the wheat from the chaff. Arrowsmith&#146;s wall maps were considered great intellectual and decorative masterpieces during their time. Notably, Thomas Jefferson possessed several such maps (including an example of the present map of Asia), which he prominently displayed at Monticello.SEE OUR WEB PAGE FOR LONGER DESCRIPTION. Paris Badouin An 9 1801 - Second edition (enlarged). 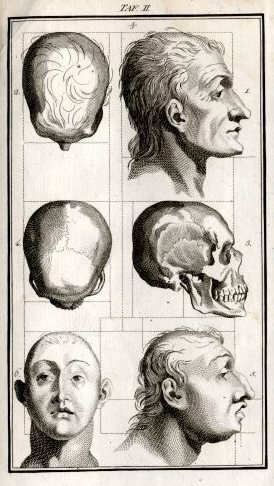 4to., 142 pp., 3 engraved plates, contemporary half calf, neatly rebacked, an excellent example. Descriptive geometry is the science of presenting a three dimensional object on a two dimensional plane. 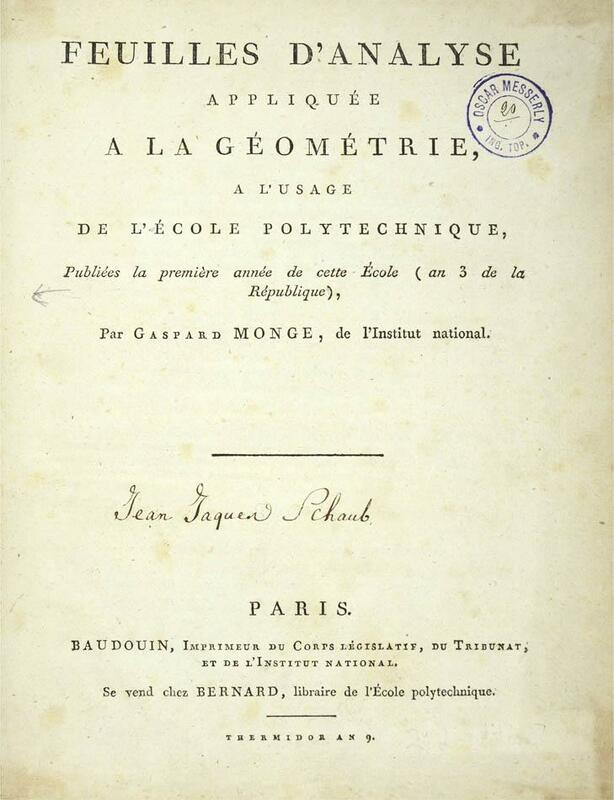 Gaspard Monge invented descriptive geometry. His methods allowed for accurate representation of objects, including shadows and vanishing points. His methods were so important and revolutionary at the time that they were kept is a military secret. Using his formulae one could simplify the optimisation of 3 dimensional problems dramatically as well as send accurate representations of objects to allies (depictions of fortifications were particularly useful at the time, being the Napleonic era). 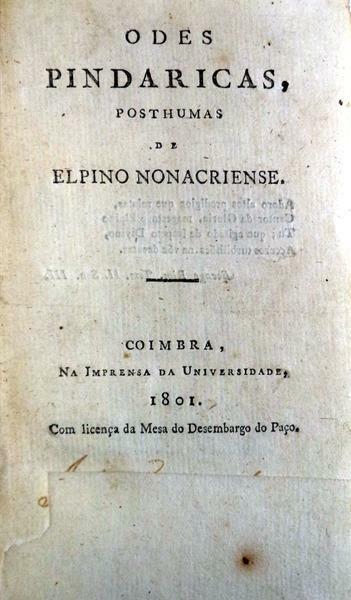 This book was first published in 1795 as a series of lectures. The internal scholia indicate that it is a second edition. It includes all 3 projections. Monge was a fervent supporter of the revolution and intellectual rigour. He later led the production of the Description de l'Égypte, wherein the accuracy of many of the depictions is testimony to his methods. Current applications of his breakthrough are numerous &#151; 3d films use his techniques of representation, the calculation of stresses on surfaces and accurate architectural modelling follow from the ideas contained in these, his early lectures. Monita über die drey gangbaren Kurarten (pp.3-64). 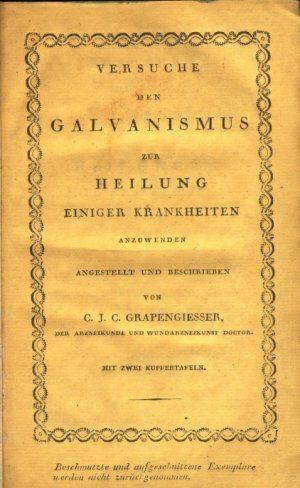 Versuche den Galvanismus zur Heilung einiger Krankheiten anzuwenden. \"BÖTTIGER, Carl August; MEYER, Johann Heinrich (Hrsg. )\"
Archaeologische Hefte, oder Abbildungen zur Erläuterung des classischen Alterthums, aus alten zum Theil noch unbekannten Denkmählern, für Studirende und Kunstfreunde. 1. Teil. Goethekreis]. - Helvig, Anna Amalie von, Dichterin (1776-1831). Fidel im Wachthäusgen". E. Gedicht (22 Zeilen) mit U. ("Amalie"). O. O. u. D. - 1 S. Gr.-4to. "Ein Bild von Treu und Häuslichkeit | Darf sich dir wohl, o Freundin, zeigen; | Ist ihm doch jene Tugend eigen, | Die höhern Werth Dir selbst verleiht. | Wenn Gleichmuth, Güte, Heiterkeit, | Dich Nachsicht und Verschwiegenheit, | Zur liebenswürd'gen Freundin prägen; | So sucht die Poesie verlegen | Der sich kein bessres Gleichniß baut [.]". - Einer dreizeiligen zeitgen. Notiz zufolge, die sich am oberen Rand der Verso-Seite befindet, ist die Adressatin des Gedichts Henriette von Bardeleben. 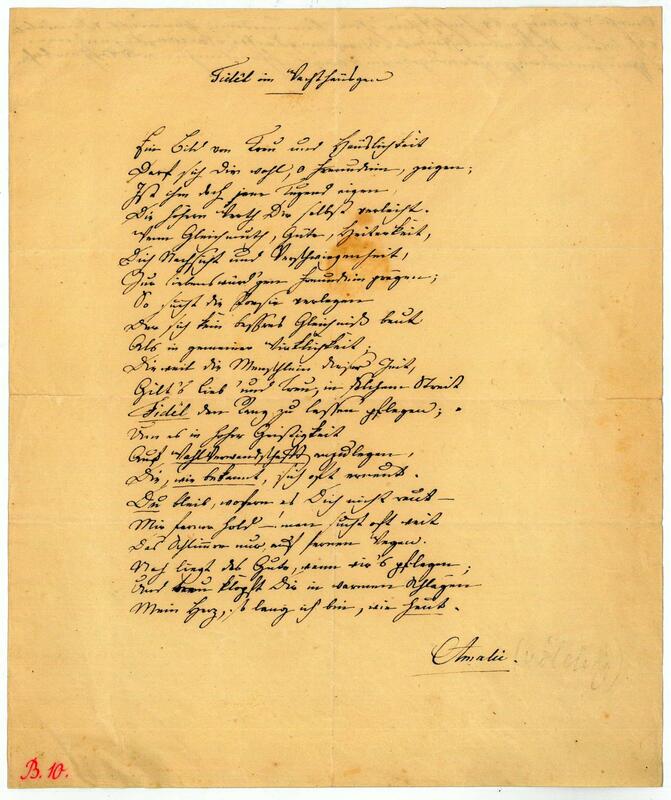 - Die Nichte von Charlotte von Stein schrieb Lyrik, Balladen und Versepen, die Schiller z. T. in seinen "Musenalmanach" und in die "Horen" aufnahm; "Goethe überarbeitete mit ihr das Epos &#130;Die Schwestern von Lesbos' (1801). Nach der Heirat 1803 folgte sie ihrem Gatten nach Stockholm. 1810 zurückgekehrt, lebte sie in Heidelberg und Berlin, 1814-16 nochmals in Schweden, dann endgültig in Berlin, wo sie dem Kreis um Bettina von Arnim angehörte. 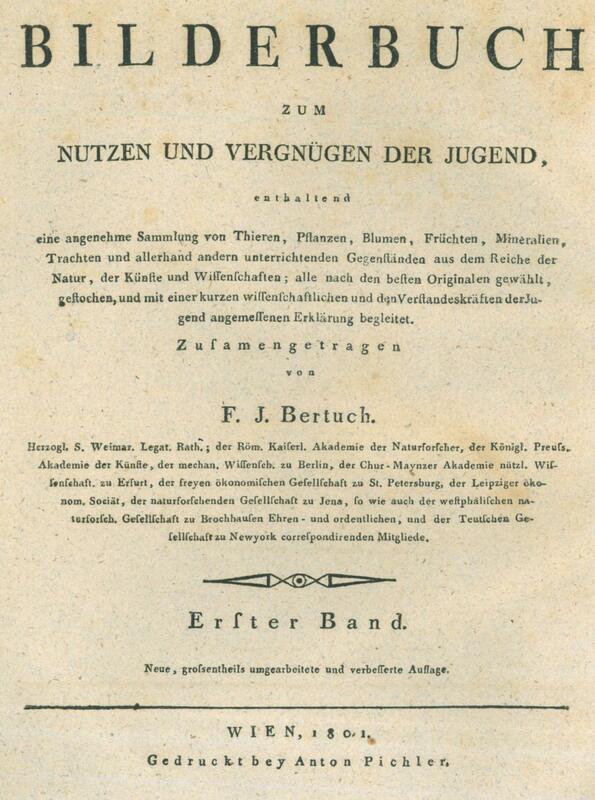 Ihrem ersten Schwedenaufenthalt ließ Helvig das von katholisierenden und altdeutschen Tendenzen getragene &#130;Taschenbuch der Sagen und Legenden' (1812; Mitherausgeber Fouqué) folgen. Ihr zweites &#130;Taschenbuch' (1817) gestaltete nordische Themen. 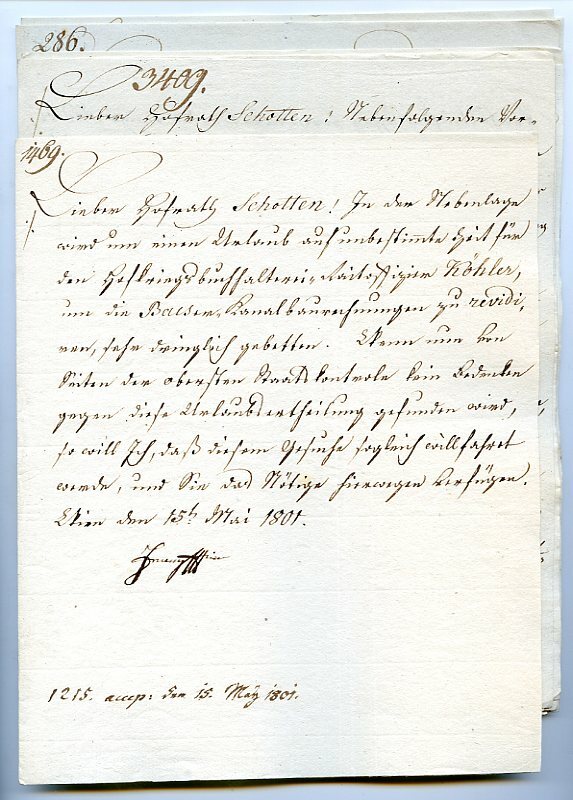 Helvigs Übersetzung der &#130;Frithiofs-Sage' (1826) Esaias Tegnérs fand Goethes Anerkennung" (DBE). - Etwas knittrig und fleckig und mit kleinen Einrissen im Mittelfalz; die Recto-Seite mit kleiner Sammlungsnummer in rotem Farbstift ("B.10. "); mit dreiseitigem Goldschnitt. Practical Observations on Angling, in the River Trent. Newark: S. and I. Ridge. 1801. 12mo. Original paper-backed brown marbled boards, in custom-made light brown buckram fall-down-back box with red morocco gilt lettering piece to spine; pp x + 12-130; baords a little bumped, very good. Provenance: with label of J. Higginbotham, Fishing rod and tackle maker, No. 91 Strand, London, to bottom margin of p. 11. Higginbotham may have been the original seller of this copy. First edition. Scarce. Written from twenty years of experience of fishing on the Trent. Westwood & Satchell p. 211. London: Knight and Compton. Very Good. 1801 . Hardcover. Quarter morocco. Head to spine repaired some time ago. Fading flying dragon illustration to spine. Chips to head of spine. (See image) Stains to title page gutter. 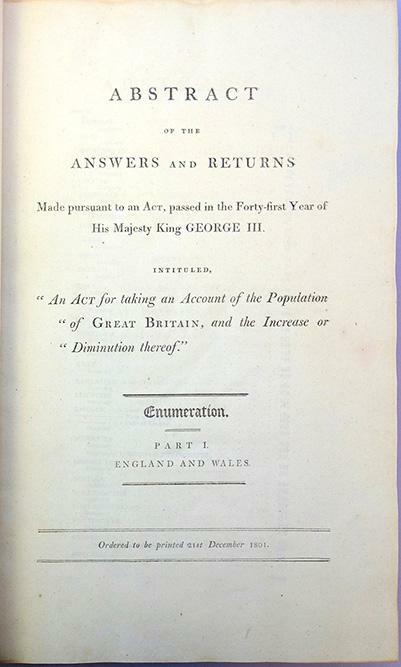 1875 reprint of 1801 edition. Frontispiece of author. 22 engraved plates in total; 5 hand-colored. Some soiling to title page at hinge. Bookplate to front pastedown. ; 9 x 11 inches; 373 pages . Stammbuch or Friendship Book of Julius Richter. Meissen / Dresden. 1801-1842. [ALBUM AMICORUM] RICHTER, Julius. 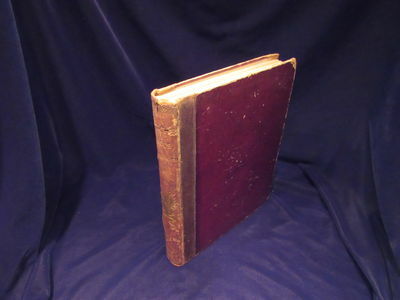 Stammbuch or Friendship Book of Julius Richter. Meissen / Dresden. 1801-1842. Landscape format, approx 120mm x 205mm. Pale blue silk covered box worn, some staining, with gilt floral decoration containing over 50 items including a folded watercolour and poem, 2 delicate watercolours of roses, a pencil sketch, a lock of hair and ribbon in a fold of paper, letters, inscriptions and poems. A fine collection of personal messages and thoughts. 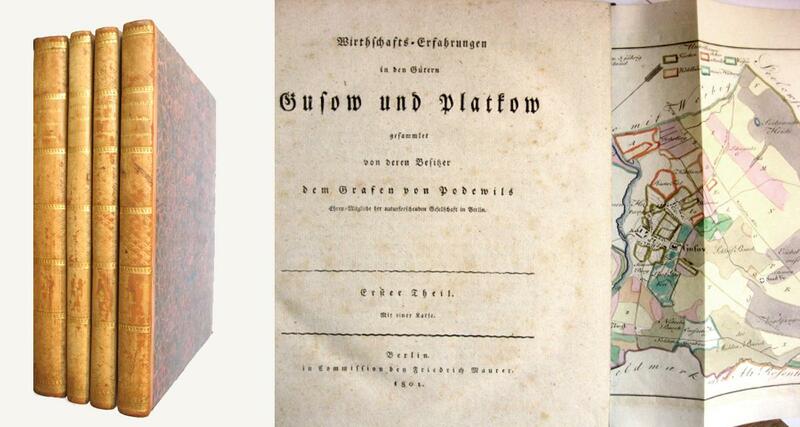 Called an Album Amicorum (Book of Friends) or Stammbuch (Friendship book), these books were popular with students in Germany and Central Europe through until the mid 19th century. The examples that we have had previously used small decorated boxes imitating a bound volume ( as in this example) instead of an album, and usually in an oblong format. This is the largest example of this type that we have handled. There are numerous entries of pupils and teachers of the Royal Saxon Landesschule Sankt Afra in Meissen, including (Friedrich) Maxim. Oertel (an historian in St. Afra) and Karl Justis Wilhelm Kreyssig (Latin professor in St. Afra). Most entries are dated St. Afra 1822-29. Some inscribers recall the common "brotherhood", which may be a precursor of the student association "Leipziger Landsmannschaft Afrania", founded in 1839. In addition there are some earlier entries from Meissen and Pforta, dated 1801-1804. 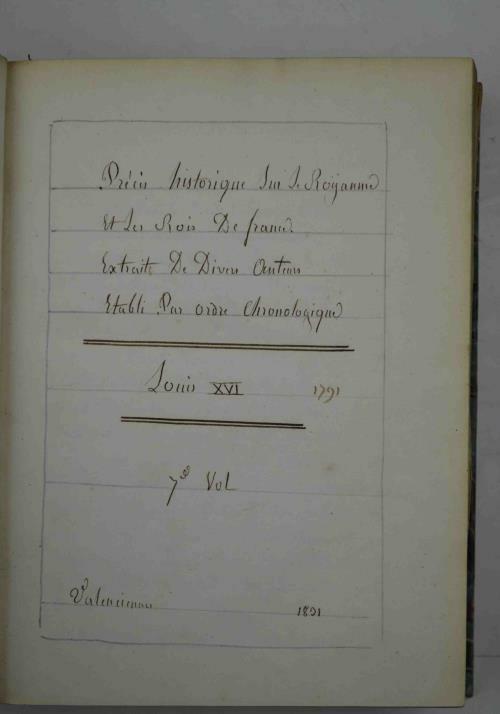 Among the letters there is one from Richter's father ("Richter / an der Liecke", with the title "Lieber Julius! "), also a humorous 3 page poem "Der Berliner Ballonhandler". Francis II, the last Holy Roman Emperor (1768-1835). Vienna, 1797 to 1801. - 4to. Altogether 12 pp. on 26 ff. 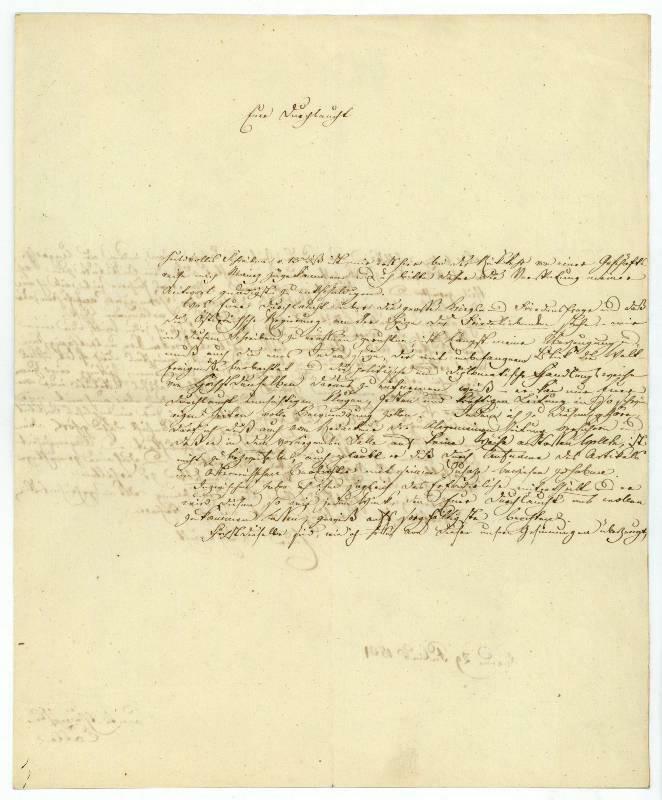 A collection of letters to a privy councillor named Schotten. Printed by W. Bulmer & Co, London, for the author., 1801. First edition. Royal octavo. Two volumes: pp [viii], 1- 236; [viii], 237-482,  advert. Period binding of full marbled calf with intricate gilt decoration, leather title-labels, marbled edges and endpapers. 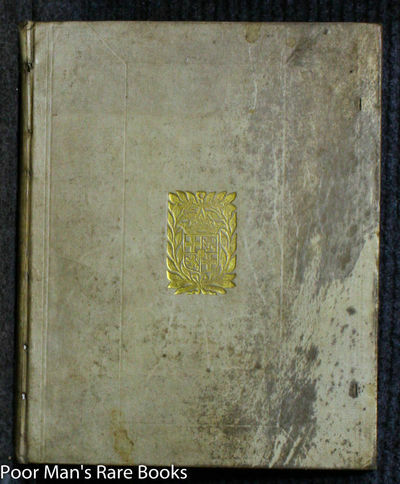 In the middle of each cover is a gilt monogram initial 'D' surmounted by a winged crown.The first known anthology of horror verse, comprising work by Sir Walter Scott, Robert Southey, Lewis himself and various others. The gothic elements for which the book is celebrated are concentrated in the first volume.On each front pastedown is an engraved armorial bookplate (Frederick Leigh Colvile). 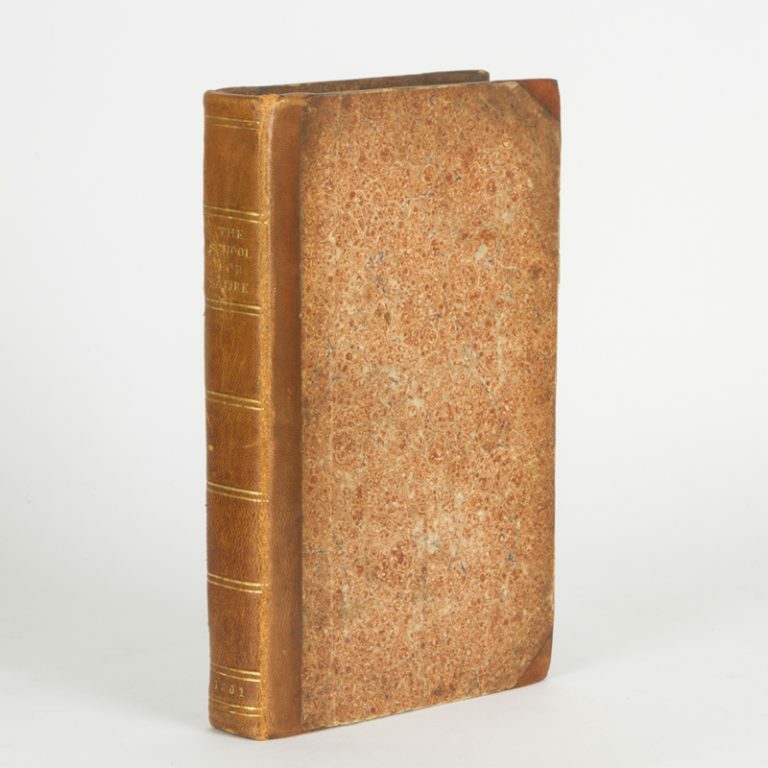 One the first blank of the first volume is the inscription, ''from my Uncle Chandos Leigh''. Frederick Leigh Colvile was a vicar, author and antiquary who lived in Warwickshire. His uncle Chandos Leigh was a schoolfriend of Lord Byron and was himself a minor poet. The family home of Stoneleigh Abbey was visited by Jane Austen in 1806 and there is reason to suppose that it provided the basis for her descriptions in Mansfield Park of the chapel at Sotherton Court.A few stains in the margins of the first volume. Upper joint of second volume cracking. 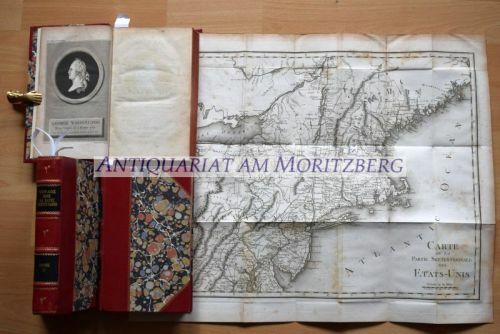 A very good set interesting both in binding and provenance. Dentu, 1801. 8vo (cm. 21), 2 Voll., 2 c.nn., 32 pp., XXVIII-226 pp. ; 2 cc.nn., 320 pp. Con complessive 2 carte geografiche, 1 pianta e 8 tavv. rip. f.t. Bross. coeve con titolo su etichetta cartacea al ds. (mancanze). Fresco esemplare in barbe con arricciature agli angoli delle prime ed ultime carte e qualche rara fioritura. 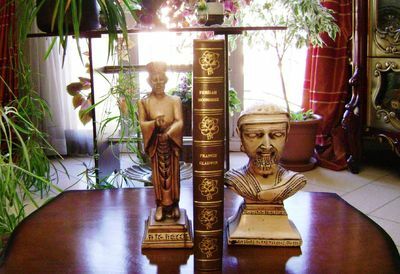 Edizione originale. Resoconto di viaggio del capitano negriero de GrandprÃ© che operÃ² a sud del Congo in seguito al rinnovato interesse colonialista francese per il commercio dei prigionieri provenienti da quella zona e dallâ€™Angola. Presente un vocabolario congolese alle pp. 156-162 del primo tomo. Le belle tavole - anche piÃ¹ volte ripiegate - raffigurano costumi e riti delle popolazioni locali. Le due carte geografiche si riferiscono alla costa dellâ€™Angola e al Capo di Buona Speranza e suoi dintorni mentre la pianta Ã¨ relativa alla cittadella fortificata di CittÃ del Capo. Raro. Presente - secondo ICCU - in tre sole biblioteche italiane. Lippold, G. H. C. / Funke, C. Ph. Neues Natur- und Kunstlexikon, enthaltend die wichtigsten und gemeinnützigsten Gegenstände aus der Naturgeschichte, Naturlehre, Chemie und Technologie. 3 Bände + 1 Supplementband (= Komplett). Weimar, Verlage des Industrie-Comptoirs, 1801-1805. Zum bequemen Gebrauch insonderheit auch für Ungelehrte und für gebildete Frauenzimmer ausgearbeitet. 1203 S., 1 Bl. ; 891 S., 1 Bl. ; 1186 S., 1 Bl., 208 S., 3 Bl., Halblederbände der Zeit mit je 2 goldgepr. Rückenschildchen, Rückengoldverzierung, Lederecken und illustr. Vorsätzen. Erste Ausgabe. - 1. Band: A (Aal) - J (Juwelenkäfer), 2. Band K (Kaneljau) - R (Ruß), 3. Band: S (Saame) - Z (Zypresse), 4. Band: Supplementband enthaltend Berichtigungen und Nachträge, einen Linneischen Nomenclator und ein deutsches Synonymen-Register. Einbände bestoßen. Innen stellenweise leicht stockfleckig, sonst sehr gut erhalten. Versandkostenfreie Lieferung Lexikon, Lexika, Nachschlagewerk, 19. Jahrhundert, Naturwissenschaft, Kulturgeschichte, Kunst, Technik, L.
Bauern-Philosophie oder Belehrungen über mancherley Gegenstände des Aberglaubens und andere nützliche Kenntnisse. Erstes und Zweytes Bändchen [von 3]. Vom Verfasser des Buchs vom Aberglauben. Erstausg. 4 Bll., 232 S. / 1 Bl., 252 S., Kl.-8, Pappband d. Zt. mit Rotschnitt (beide zus. in einem Bd.) Im Jahr 1801 erschien noch ein drittes Bändchen, u. 1802 eine neue Aufl. des kritischen Buchs. Fischer will die abergläubischen Meinungen zur Schau stellen u. dadurch dazu beitragen, diese "auszurotten". U.a. über: Bsp. u. Erzählungen, wie uns unsere Sinne u. Einbildungskraft täuschen können Ueber Mondsüchtige u. Nachtwanderer Ueber Träume u. Traumbücher Die künstliche Auferstehung der Todten, oder das Geistercitiren Ueber den Unfug der Wünschelruthe Von Hexen, Hexenmeistern u. ihren Thaten Edlicher Bescheid über das Wahrsagen. - Einband ist stark beschabt u. an den Kapitalen etwas beschädigt im ersten Band etliche Seiten mit Wurmfrass im inneren Rand (kein Textverlust), sonst innen sauberes u. gutes Expl. - Sehr selten, im Gegensatz zum "Buch vom Aberglauben" nicht bei Ackermann od. Hayn-Gotendorf. Jan 01, 1801. Leather Bound. Good. London: Published by Oriental Press by Wilson and Co., 1801. By Francis Gladwin, ESQ. (300 × 230 mm). Rebound Late 19th-century brown leather, raised bands to spine with 6 ropework fillets gilt, Folding verb table. Contents lightly toned with occasional faint spotting as usual, tan-burn to endpapers from turn-ins, A very good copy. London edition of Gladwin's Persian grammar, Part II comprises a series of illustrative ""Hikayati Luteef"" (""sweet stories""), with Part III, ""Phrases and dialogues in Persian and English"", excised for this edition. The ""Moonshee"" (from the Persian ""munshi"", an honorific given to skilled linguists and clerks) was first published in Calcutta in 1795. ""The most frequently published author in late eighteenth-century Calcutta, Gladwin was responsible for dictionaries and vocabularies, translations of Persian histories, collections of stories and revenue accounts, treatises on medicine and rhetoric, and a Persian version of an abridgement of the biblical history None of this activity is likely to have been lucrative. Gladwin confessed to spending heavily in acquiring manuscripts. Publication costs in India were notoriously high and the market was very restricted. Success depended largely on the willingness of the East India Company to purchase multiple copies"" (ODNB). CRUZ E SILVA. (António Diniz da). Reise nach der westlichen Küste von Africa.in den Jahren 1786 und 1787. A Paris, chez Duprat [de l'Imprimerie de Crapelet], an IX : 1801 [et] 1800, in-8, XII-157--XXIII-303- pp, 3 tableaux dépliants, basane tabac de l'époque, dos lisse et fleuronné, pièces de titre vertes, triple filet d'encadrement sur les plats et petites fleurs d'angle, Sans les faux-titres et la liste des écoles centrales au verso. Troisième édition. Traité élémentaire d'arithmétique, publié pour la première fois en 1797, et seconde édition des Éléments d'algèbre. Sylvestre-François Lacroix (1765-1843) fut titulaire de la chaire de mathématiques à l'École militaire jusqu'à sa dissolution, puis il enseigna les science à l'École Royale d'Artillerie de Besançon et les mathématiques à l'École Centrale de Paris, tout juste créée et installée au Collège des Quatre-Nations ; il assista son mentor, Monge, pour ses cours de géométrie descriptive à l'École Normale et il publia, avant même son inventeur, le premier traité sur cette nouvelle discipline. Lacroix est surtout connu pour son Traité sur le calcul différentiel paru en 1797-1798. DSB VII, pp. 549 et suiv. Plats légèrement tachés et frottés. Cotta, Johann Friedrich Frh. von, Verleger (1764-1832). Eigenh. Brief mit U. ("Cotta"). Baden, 29. VII. 1801. - 2 SS. auf gefalt. Doppelblatt. 4to. Von der Forschung vermisstes Schreiben an den (nicht namentlich genannten) österreichischen Staatskanzler Fürst Metternich, der wegen kritischer Artikel mit dem Verbot von Cottas "Allgemeiner Zeitung" gedroht hatte: "Euer Durchlaucht huldvolles Schreiben v. 13ten dieß. ist mir erst hier bei der Rückkehr von einer Geschäftsreise nach Mainz zugekommen und ich bitte daher die Verspätung meiner Antwort gnädigst zu entschuldigen. Was Euer Durchlaucht über die große Kriegs- und Friedensfrage und daß die Österreichische Regierung an der Spize der Friedeliebenden stehe - mir in diesem Schreiben zu eröffnen geruhten, ist längst meine Überzeugung und muß auch die eines Jeden seyn, der mit unbefangenem Blick die Welt-Ereigniße beobachtet und die politische und diplomatische Handlungsweise von Höchstdenselben daraus zu entnemen weiß - er kan nur Euer Durchlaucht umsichtigen, klugen, festen und kräftigen Leitung in so schwierigen Zeiten voll Bewunderung zollen. Indem ich zu diesen gehöre, darf ich dieß auch vom Redacteur der Allgemeinen Zeitung [Karl Joseph Stegmann] versichern, und daß er in dem vorliegenden Falle auf keine Weise anstossen wollte, ist nicht zu bezweifeln, auch glaubt er dieß durch Aufnahme des Artikels im Österreichischen Beobachter mit seinem Zusaze bewiesen zu haben. Inzwischen habe ich ihm sogleich das Erforderliche mitgetheilt und er wird diesen so wie jeden Wink, den Euer Durchlaucht uns wollen zukommen lassen, gewiß aufs sorgfältigste beachten. - Höchstdieselbe sind, wie ich hoffe, von diesen unseren Gesinnungen überzeugt, Sie besizen Selbst in der neuesten Zeit die Belege davon, indem die Ungarischen Komitatsadressen zurückgehalten wurden, unerachtet dieß dem Institute zum Nachtheil gereichte und zum Vorwurf gemacht wurde. Von etwas früherer Zeit will ich mir nur erlauben, den gänzlichen Ausschluß des fameusen Hormayers anzuführen, der mich dagegen überall, selbst bei Euer Durchlaucht, zu verläumden sucht. So sehr ich die Warnung gegen diesen Menschen, so sehr ich jeden Wink, den mir Euer Durchlaucht wollen zukommen lassen, mit dem wärmsten, unterthänigsten Dank erkenne, so sehr bedaure ich aber, daß ich ich nicht wenigstens durch [Josef Anton] Pilat, öfters dergleichen erhalte. Denn die Redaction der Allgemeinen Zeitung wird zuverlässig Alles, was mit dem Zweck und Bestehen dieses Instituts nur vereinbar ist, gerne beachten. Euer Durchlaucht werden also auch mit mir die Überzeugung theilen, daß unsre Zeit auch für ein solches Institut eine kritische ist, und daß viele Klugheit und Umsicht dazu gehört, demselben seinen Charakter der Wahrheit, Unpartheilichkeit und Allgemeinheit zu erhalten, das Möglichste dabei zu beachten und doch eine eine gewichtige Stimme für die öffentliche Meinung demselben zu erhalten [.]". - Nachdem sich Metternich bereits Ende 1828 bei Cotta über österreichkritische Artikel in der "Allgemeinen Zeitung" beschwert hatte (wofür sich der Herausgeber am 17. 12. 1828 brieflich entschuldigte), wandte sich der Staatskanzler im Sommer 1831 erneut an Cotta. Mit Schreiben vom 13. Juli beschuldigte er ihn, "sich nicht um die inhaltliche Tendenz, sondern nur um den wirtschaftlichen Erfolg der Zeitung zu kümmern, und drohte wiederum mit dem Verbot der AZ in Österreich, sollte sich die Zeitung nicht dazu bereit finden, ausschließlich österreichfreundliche Artikel zu drucken. Ursachen für den neuerlichen Verweis waren Artikel, die Metternichs Meinung nach 'falsche Ansichten über die friedlichen Zwecke der österreichischen Politik' verbreiteten" (M. Breil, Die Augsburger "Allgemeine Zeitung" und die Pressepolitik Bayerns [Tübingen 1996], S. 175). Während die Forschung noch unlängst konstatieren musste, eine "Entgegnung Johann Friedrich Cottas hierauf oder eine Reaktion der Redaktion [sei] nicht erhalten" (ebda. ), bildet der vorliegende Brief unzweifelhaft diese vermisste Entgegnung. - Alte Faltspuren; von tadelloser Erhaltung. Wirthschafts-Erfahrungen in den Gütern Gusow und Platkow (4 Bände). De Pyramiden of wonderlyke lotgevallen van Buonaparte in de ruinen van Memphis in Aegypten (...) volgens eenen origineelen brief des eersten consuls, gevolgd naar een Hoogduitsche vertaaling van Theodorus Flammberg. 2e druk, Groningen, Eekhoff, 1801. Origineel papieren omslag, 28 pag. Volgens het voorwoord door Napoleon zelf geschreven. Het boekje beschrijft hoe Napoleon en zijn vrienden Brakonelli en Fleureux verdwaalen in een pyramide. , 84 pages. Illustrated with a copper-engraved frontispiece, and twenty-nine small woodcuts within the text. Original marbled boards sometime re-backed with cloth and with the addition of a hand-written label. 120 x 80 mm. 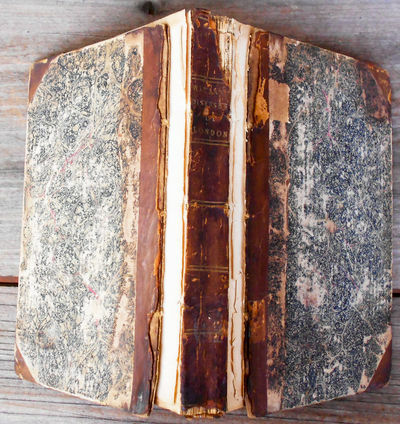 Corners a little worn; joint between frontispiece and title repaired; else a very good copy. See Darton G394(60.. THE INFANTS' CABINET of INSECTS. Comprising of a wooden box with a sliding lid bearing a pictorial hand-coloured pastedown, 26 of 28 hand-coloured engraved cards, and one [of two] miniature book, of thirty pages, plus I page of ad's.Lacks volume II, and two cards; some soiling to the cards and pages of the book, but a good copy of a rare item. See Alderson, the Quarterly Journal of the Private Libraries Association [Vol 6. No. 1 Spring 1983] . 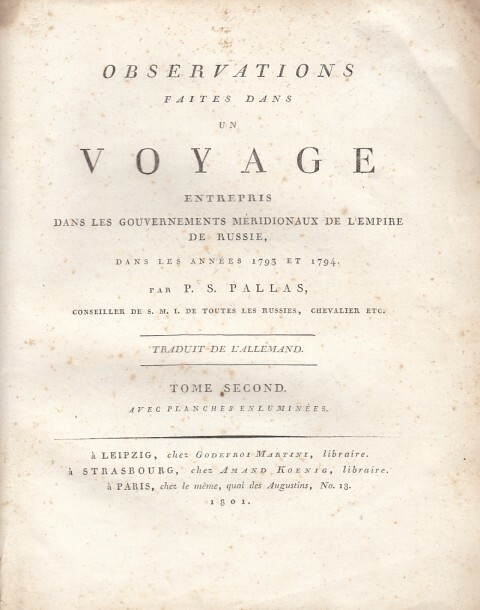 Voyages from Montreal on the River St. Lawrence, through the Continent of North America, to the Frozen and Pacific Oceans; in the years 1789 and 1793. With a preliminary account of the fur trade of that country. London. Printed for T. Cadell. 1801.. 1st Edition. Hardcover. 4to. 27cm, the First Edition, cxxxii,412p., engraved frontis portrait by P. Cond after T. Lawrence and 3 engraved folding maps, (some expert repairs on the folds of the large route map), average toning to the text, the large general map expertly restored along the folds, expertly bound in contemporary style half speckled tan brown calf, gilt decorated raised bands, gilt device decorations in the panels, black calf label gilt titles, marbled boards, armorial engraved bookplate, some slight toning to the text otherwise a near fine copy in attractive fine binding. T.P.L. 658. Lande 1317. Sabin 43414. Strathern 343. Peel 25. Gagnon 2190. Morgan p240. Hill p187. First edition of the classic narrative of the first white man to cross the continent. . "the earliest expedition made by a white man in this direction. His investigations, although pursued at so early a period of Arctic exploration, were remarkable for their accuracy; Sir John Franklin more than once expressed his surprise at being able to corroborate their correctness in his own explorations. Some Indian vocabularies are included. (Sabin). Mackenzie's journals recount his two expeditions undertaken on behalf of the North West Company in their attempt to break the Hudson's Bay Company's monopoly of the fur trade. The first expedition, in 1879, from Fort Chipewyan on Lake Athabaska down what is now known as the Mackenzie River to the Arctic constitutes the first trip to the Arctic from the Canadian Prairies. The second, in 1792-93, from Fort Chipewyan over the Rocky Mountains by the Peace and Fraser Rivers to the Pacific, is distinguished as the first overland expedition to reach the Pacific, north of Mexico. The maps are the earliest of certain parts of Canada. Also included is a lengthy account of the development of the fur trade in the North West, generally attributed to the author's cousin, Roderick Mackenzie. .
La sagesse humaine, ou Le portrait d'un honnête homme.| Imastut'ün mardkayin, kam Nkaragir arak'inwoy. (Colophon in Armenian only: Venetik [= Venice], Surbn Lazar [= [Monastery of Il] San Lazzaro [degli Armeni]], 1844). 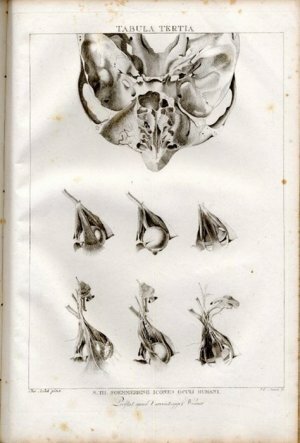 Small oblong 24mo (5 x 9.5 cm). With the title and main text printed in parallel French (on the versos in roman type) and Armenian (on the rectos in Armenian type) on facing pages. 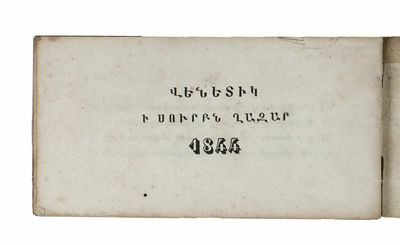 Original publisher's printed paper wrappers in Armenian only. No edition with the Armenian text in: Armenian libraries union catalog; Armenian early printed books 1801-1850; armenology.net; ICCU; KVK; Quérard; WorldCat. Unrecorded French and Armenian edition, the first and only edition to include the Armenian text, of fourteen numbered educational maxims in the form of four-line verses (quatrains), written in French by François de Salignac de La Mothe Fénelon (1651-1715), archbishop of Cambray, probably for the education of Le Petit Dauphin, Louis, Duke of Burgundy (1682-1712) when Fénélon tutored him in the years 1689-1697. It appears here as a school book printed and published by the printing office of the Armenian Catholic (Mkhitarist) monastery, established in 1717 on an island in the Venice lagoon, since known as Il San Lazzaro degli Armeni. In very good condition, with only an occasional small spot or tiny marginal tear, and nearly untrimmed. The wrapper has small tears along the fold (repaired at the head) and some minor stains, but is otherwise also very good. Précis historique du S. Royaume et du Roi de France. Extraits de divers Auteurs établi par ordre chronologique. Louis XVI. 7.eme volume. Bilderbuch zum Nutzen und Vergnügen der Jugend. - Porte-Feuille instructif et amusant pour la jeunesse. present reign. London : Printed and sold by Jaques and Co. Lombard-Street, Fleet-Street, 1801. 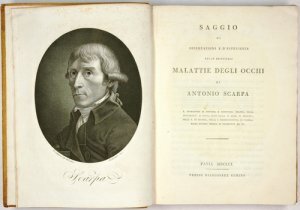 First edition (reprinted in 1802). 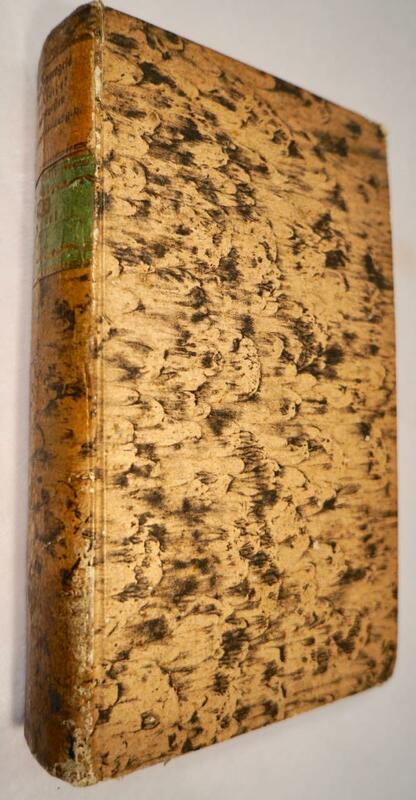 Octavo, contemporary half sheep over marbled papered boards (rubbed), spine with gilt lettering and rule, front paste-down with two twentieth century bookplates, bound without the half-title, [vii], 416 pp, (pp 81-96 duplicated in pagination), contents clean and crisp, a very good copy. 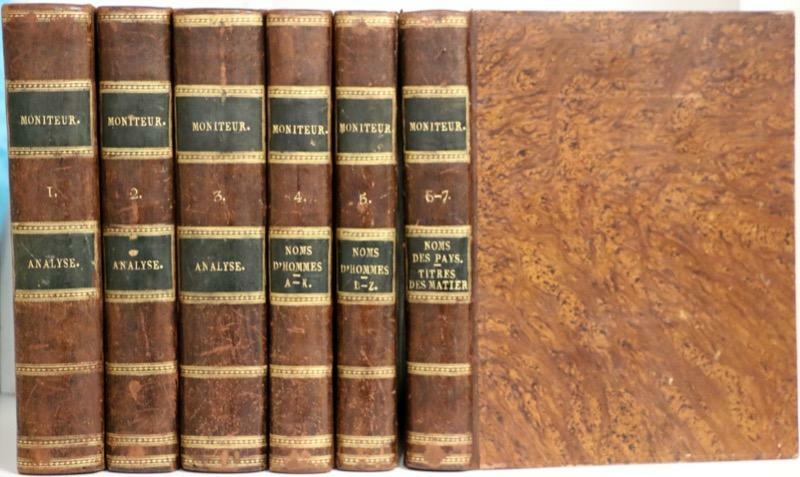 A collection of sixteen satirical pieces, includingAn Epistle from Oberea, Queen of Otaheite, to Joseph Banks, Esq. (now the Rt. Hon. Sir Joseph Banks. K. B. P. C. President of the Royal Society, &c. &c. &c. &c.). Translated by T. Q. Z. Esq. Professor of the Otaheite Language in Dublin, and of all the Languages in the undiscovered Islands in the South Sea. Enriched with historical and explanatory Notes. An Epistle from Oberea, first published in 1774, is a satire written in verse imitating the style of Ovid, on the imagined romantic liaison between the Queen of Tahiti and Sir Joseph Banks. It was published anonymously, but is now generally accepted to be the work of Scott-Waring, a major in the British East India Company. The school for satire is unrecorded in Australian collections. Révolution Française ou analyse complete et impartiale du MONITEUR suivie d'une table alphabétique des personnes et des choses. Nelson, Horatio, 1st Viscount Nelson, British admiral (1758-1805). St. George, Revel Bay [Gulf of Finland], 15. V. 1801. - 4to. 1 p. With fly-leaf bearing address in his handwriting, and his seal (head of Lady Hamilton). Fine autograph letter to "Lady Hamilton, 23 Piccadilly, London". An important letter written when Nelson was Commander-in-Chief in the Baltic, six weeks after the Battle of Copenhagen. The political situation was complicated in that the Russians, while not now openly hostile, were definitely unfriendly. The cold air of the northern latitudes disagreed with Nelson, who had a severe cough and chill, and he was depressed at the separation from Lady Hamilton and concerned about their baby daughter Horatia, who had been born in January. 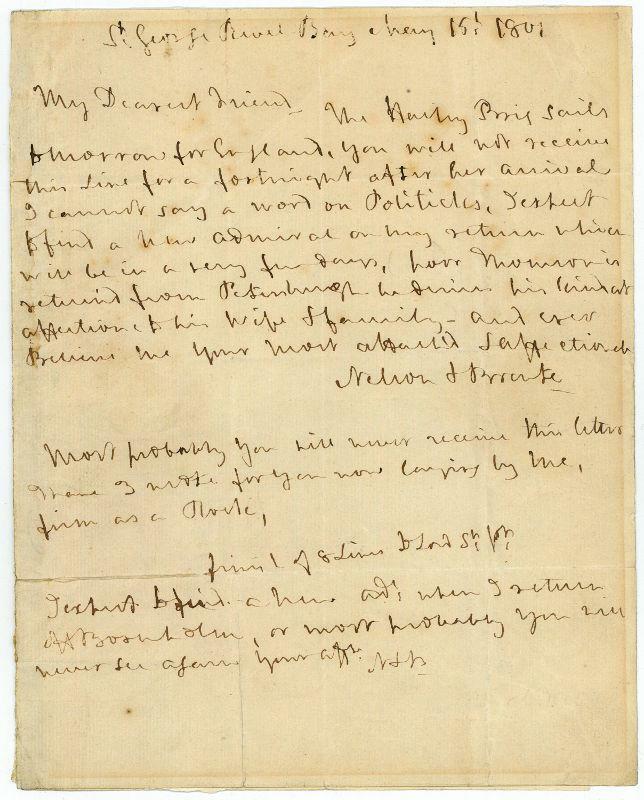 The letter is discreet, evidently because of Nelson's fear that it might fall into other hands, and he employs the deception previously arranged with Lady Hamilton of referring to himself as "Thomson". The tone of the letter is melancholy, and Nelson concludes by quoting the last portion of an equally unhappy letter he had written recently to the First Lord of the Admiralty Lord St. Vincent: "My Dearest Friend, / The Harpy Brig sails tomorrow for England, you will not receive this Line for a fortnight after her arrival. I cannot say a word on Politicks. I expect to find a new Admiral on my return which will be in a very few days, poor Thomson is return'd from Petersburgh he desires his kindest affections to his Wife and familiy [i. e. to Emma Hamilton herself and Horatia] - And ever believe me Your Most attach'd & affectionate / Nelson & Bronte. / Most probably you will never receive this letter I have 3 wrote for you now laying by me, firm as a Rock, finish of 8 lines to Lrd. St. V[incent]. I expect to find a new Ad[mira]l when I return off Bornholm, or most probably you will never see again aff[ectiona]te / N & B". London: R. Phillips, 1801. First edition. original half calf over marbled boards, lettered in gilt. Covers detached but present, rubbing of covers, front fly leaf detached but present,bookplate and old name in ink on front endpapers, else fine. 12mo. "A part of the following reports was inserted in the Monthly Magazine for the years 1796, 1797, and in the Medical and Physical Journal for 1799. ...to give, under some proper arrangement, an accurate history of the disorders prevalent in or near London, from actual observation, without any bias from the consideration of diseases of other climates, and without a constant reference to the congeries of symtpoms details by systematic writers. ..."- from the Introduction. 8. Gest. Frontisp., 216 S. Broschürt, Buchblock geheftet, Rücken fehlt großteils, Heftung gelockert. Buchblock unbeschnitten, Blätter staubrandig, sonst fast weiß u. fleckenlos. GV 155,418. Vgl. Wurzbach 55,13ff. (Ausg. 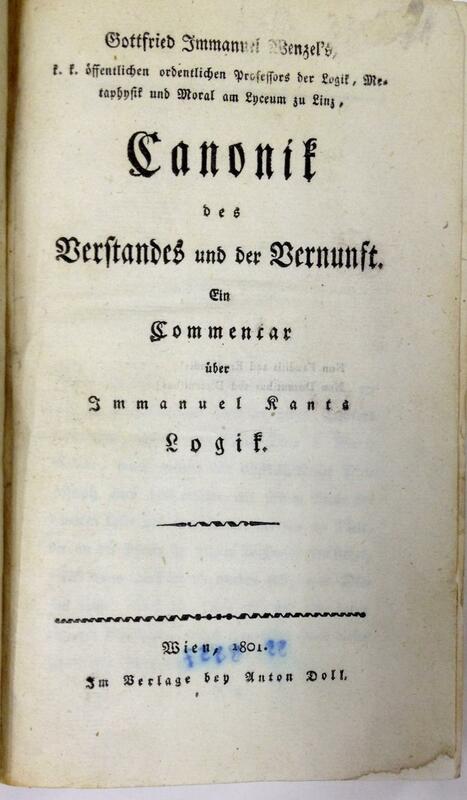 Wien 1801) - W. (1754-1809), seit 1800 Professor für Philosophie u. Geschichte am k.k. Lyzeum in Linz, war als "... pädagogischer u. philosophischer Schriftsteller ungemein tätig", lt. Wurzbach war er "... der erste selbständige philosophische Schriftsteller in Österreich ... er schrieb leicht, faßlich und gut." Besonders hebt Wurzbach seine "Beiträge zur Thierseelenkunde" hervor "... welche eine scharfe Beobachtungsgabe verrathen und uns Einblicke in das Leben und die Fähigkeiten jener Wesen eröffnen, die ... doch am wenigsten beobachtet werden, so sehr auch sie Beobachtung verdienen". Wodurch W. auch als Vorläufer der Verhaltensforschung anzusehen ist.